Update 2019 for What is the Worst Deck Stain? We here at DeckStainHelp.com are proud to be the internet’s number one reference for all things wood deck restoration related. If you have had a negative experience with deck stains, you have come to the right place to warn people. We are always looking for ways to engage with our readers, so we appreciate your input and questions by leaving a comment below. Have you had a bad experience with a decking stain? Our most popular article, “What is the Best Deck Stain” has become the #1 article for consumers on the Internet for deck stain questions and answers. We have decided to create an article based on negative consumer feedback and experiences with decking stains. We are looking for bad experiences with a particular brand of decking stain. 5. A brief description of your overall negative experience. Note: This is mostly for fun and to allow you to vent your frustration! We appreciate you visiting Deckstainhelp.com as we continue to be your go-to source for the latest in deck restoration news and trending topics through 2019. Please vote for your favorite wood and deck stain. 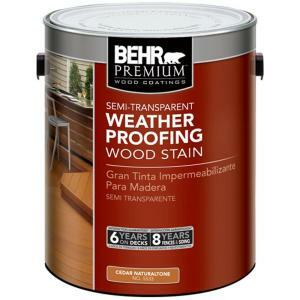 Important Note: This is our 2nd Review of Behr Exterior Weatherproofing Wood and Deck Stains. BEHR’s best semi-transparent product, this advanced 100% acrylic formula penetrates deep into wood to deliver complete protection from the elements for up to 6 years on decks and 8 years on fences and siding. The silicone-fortified formula delivers excellent protection from the sun’s harmful UV rays. BEHR PREMIUM® Semi-Transparent Wood Stain is available in 60 custom colors that add beauty while allowing the natural wood grain to show through. The alkyd/acrylic formula combines the benefits of an oil-based finish and the convenient clean up of a water-based product. – The application of the Behr Premium Weatherproofing Stain was a repeat of our first test. We found that the Behr does not penetrate into the wood like the product claims it should. It dries on top of the surface like a paint. It had the look of a semi-solid with much of the wood grain masked by the pigment. The Cedar color on the deck made it look like a pumpkin. – The one positive about the Behr is that it has excellent UV protection in the areas where the stain had not failed. Unfortunately, this was only half of the deck floor and most of the railings. – The cedar porch was “Behr” of stain on more than half of the flooring. The stain had peeled or worn in large uneven patches. Vertical rails did not have any issues.